St.Luke's has been the second church of the Parish since the early 1900s. It was built in an area of Newport Pagnell that was then growing in population. It was affectionately labelled the 'daughter' church but with its title perhaps should have been called the 'brother' to St.Peter & St.Paul. At the time of its build, and for a long time after the town had a Vicar and a Curate and oversight of St.Luke's was given to whoever was the Curate at the time. In its first 60 or 70 years of life it had quite a number of ministers taking care of its congregations. During its lifetime St.Luke's has served both as a church and quite busy community building. Over these years it has been home to groups such as, Rainbows, Brownies, and Guides, a Preschool, an Irish Dance school and a Yoga group. Plus of course our own many church activities. Over the years the congregation has grown and shrunk at times and presently is steady at a smallish number of regular worshippers. Although we have two Anglican Church congregations in the town we do get together for special services and social events. Because of its larger size St.Peter & St.Paul lends itself better to large congregations so joint Parish services are generally held there. 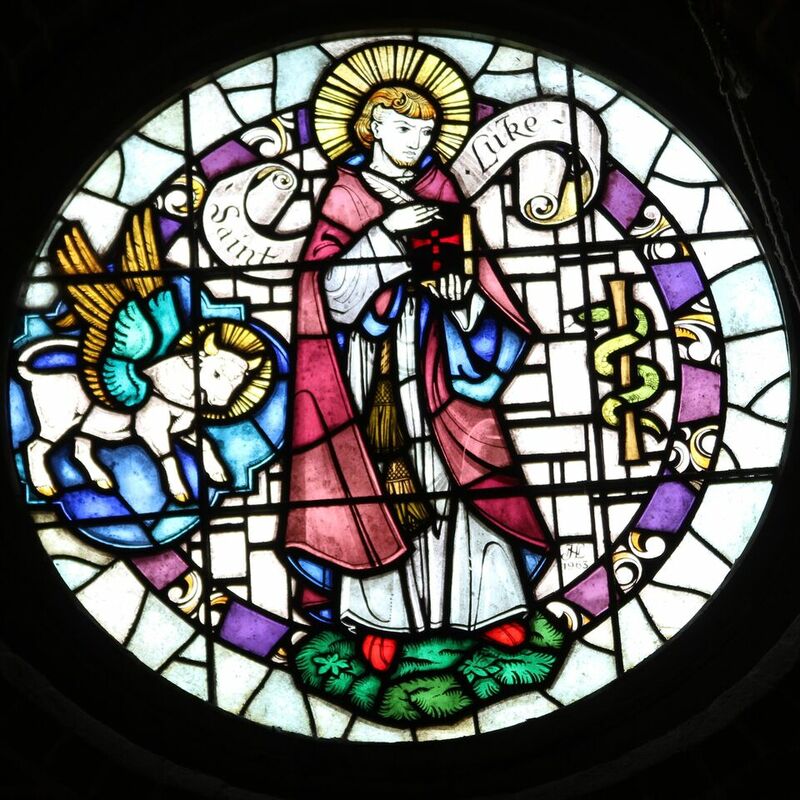 The stained-glass windows at St Luke’s are worth a second glance if not a much closer look! John Nicolas Lawson was one of the leading stained-glass artists of his generation and these windows are some of his earliest works. The roundel above the west door depicts our patron saint, St Luke, holding a pen in one hand and with a copy of his gospel in his arms. On the right you can see the staff of Asciepius referring to Luke’s profession as physician and on the left the winged ox symbolising Luke’s gospel with its focus on Jesus’ sacrifice of himself for the sins of the whole world. The two smaller panels at the east end of the church are of the Annunciation of the Blessed Virgin Mary. Gabriel is on the left and Mary on the right - note the symbols of the Holy Spirit in the form of a tongue of fire on the angel’s forehead and the dove descending towards the blessed virgin. These three windows were made in 1963. It is perhaps the east window made five years later, that is most interesting. The Last Judgement was donated and designed by Mrs Doris James a local artist, lace maker and regular member of St Luke’s congregation for many years. Mrs James was rather disappointed by the window because she felt the face was too stern. The artist however apparently liked the design because he revisited it several times later in his career. 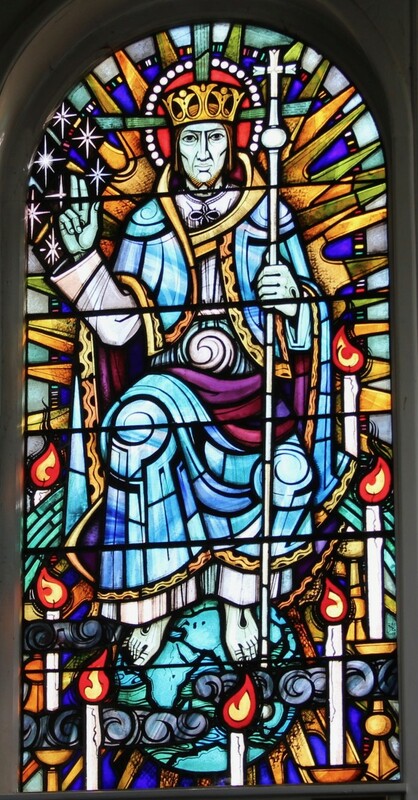 The most notable example is probably his stained-glass panel Christ the Judge hanging in Rippon Cathedral.